Light raspberry bouquet with gentle spices and a touch of chocolate covered cherries. Palate--Understated, fruit flavors, with an overly acidic foundation, a fleeting finish of faded fruit leaves my mouth underwhelmed. 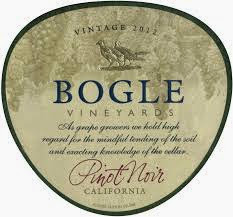 Bogle has been producing some real values wines of late but this California sourced Pinot just doesn't do it. I'd let this one go by the wayside.